OK, so if you’ve been reading this blog for any amount of time, you may know that I have several posts related to the topic of the retractable adamantium claws of our all time favorite X-Man, Wolverine. In fact, I have talked about several different kinds of Wolverine claws, and innumerable miserable replicas and wannabes, from X-Claws that would most likely implant themselves in your knuckles, to the Bear and Pantera claws and so on, that would probably rotate down and try and embed themselves in your wrist if you ever tried to do anything even remotely Wolvie-like with them. I think I even looked at the practicality of having claws surgically implanted in ones forearm… (Just as a quick reminder to everyone, that was a distinct “No Go”). However there is one last way to get Wolverine claws that i don’t think anyone has talked about. At least not until now. Probably because it would be the fastest way to get good old Wolvie to relieve you of your lease on life. Yeah… I never said it would be easy. Or even survivable. But it appears that someone has replicated just that particular option. I give you: the Skull Gauntlet. Ok, ok, yes, yes yes, so Wolvie never had little skulls on his knuckles or embedded into his wrist. But the guys who are selling this assure us that it will make you and I look like wolverine, except better… Honest! Absolute heresy. No external claws of any kind will EVAR look better than Wolverines. Just not gonna happen. No. Don’t even think about it. BTW, In case you hadn’t realized, that last paragraph was my feeble attempt to short circuit any possible subsequent fanboi rant comments resulting from this post. I do not expect to see any more. Be warned. Lest you want a claw, upside your head. With a swiftness. What? Don’t think I can deliver a claw upside your head over the internets? Please. Try me. Just try me. Please. But back to the nitty gritty. What you are looking at is a very stylized satin finished stainless steel skeleton of a wrist and hand, with small skulls over each knuckle, and a larger stylized skull over the wrist, with what looks like skeletal bands extending down on either side of the wrist. By no means an anatomically correct representation, as it appears to be missing a set of phalangeal bones, and has some sort of structural webbing between the metacarpals, probably to short circuit any “Hey! You ripped off Wolverines skeleton!” claims, but good enough. However what it does have are claws. Beautiful, beautiful claws. A set of three sweet steel claws extending from between the knuckles. And, in an unprecedented act of practicality, the wrist of this hand is attached to a what appears to be a leather band in the back, and in front, attached to the knuckles, a steel bracket with an actual grip!! Ye Gods! Someone could actually use this! AMAZING!!! Providing no ridiculously weak joints exist between the blades, the bracket and the rest of the gauntlet/hand, I must admit, this is one of the first truly practical implementation of wolverine claws I have come across. I could seriously do without the skulls, (I see human, elven, dwarven and orc skulls all over the place in my cave here, thanks to the roach-like orcs that appear to have infested the place, and frankly, it’s getting old…) and all the extraneous steel (which we have discovered, thanks to the hands-on review by Sinza over at Exotic Automatic, is actually a plastic covering over a steel frame) wrapping down around the side in the back, but I’m stoked enough that it is actually a practical, though rather non-conformist, design. And it’s a clever, if a little twisted, idea. to boot. Why try and remove the claws from the Wolverine? Just leave them on and strap his whole hand to your wrist instead. Heh. And I thought I was nuts. But in the greatest of ironies… I think this would actually work! Now this is a no-no for reasons i will get into shortly, but it is ostensibly a rather cool looking little wrist weapon. It’s got a steel fist plate/guard with recesses that are used to store a pair of stainless steel spikes (with leather thong tassels, no less), and the front of the plate is formed into these three spikes that project out over your knuckles. Though it may not seem particularly obvious, there are some rather problematic design flaws with this weapon. The biggest, and one which I talked about a little bit in my Assassins Creed Blade Guide, is the need for a stable platform upon which to mount any wrist or arm mounted blade. This weapon, unfortunately, does not have any such secure mounting. 1. Velcro, when used by itself, is perhaps one of the worst ways to secure a wrist mounted device. In this case it was used to ensure a tight fit of the rear strap, regardless of the wearers wrist size, because that secure fit is a very neccessary requirement of a wrist worn weapon. However because velcro is designed to be pulled off with little resistance, all it would take is a sideways glancing blow from something else to loosen it, or even worse, make it come off altogether. Velcro does have the strength to be used for applications like these, but needs to be part of a properly designed fastening mechanism, with a secondary fastening device, wrap, strap sleeve, or lock mechanism covering the velcro strip, in order to make sure it can’t just be pulled off once it’s secured. Or just a regular tried and true buckle. So… – Strike One. 2. That band on the front? The elastic one? That’s a nonstarter. First because an elastic band will never give you a solid mount for ANYTHING that will be used in this fashion. It will move when you don’t want it to, allow the whole thing to slide backwards when you need it to stay in one place, and will generally be a major nuisance. It really needs to be another nylon/velcro strap. And I can’t see how exactly this is fastened to the plate underneath, but using a couple of screws with an elastic strap doesn’t seem too bright of an idea either. You run the risk of the strap stretching out and slipping out from under the screws/bolts/plate, whatever they have under there. Just not the best idea. So for that – Strike Two. 3. The last is not as obvious a problem, and probably wouldn’t be such a big deal if the straps weren’t such a mess, but if you look at how that rear strap is attached, you’ll see that it isn’t really attached to the plate. It’s stitched to the nylon webbing an inch or so after the plate ends. This, IMHO, is a problem. A rather insidious one. In general things like this work best when the mounting straps are attached to the most rigid part of the platform, which, in this case, is the metal plate. NOT the flexible nylon webbing. Either the webbing should have been smaller, or the plate should have been longer, but either way, the velcro strap should have been attached to the rear of the plate. Seriously, when a weapon mounting strap is attached to a flexible, non-rigid spot on your wrist mounted weapon, bad things tend to happen when it is used… Trust me. The possible resulting carnage to the wearer if it is used like this would not be pretty. So all I’m going to say is… Steeeerike Three! 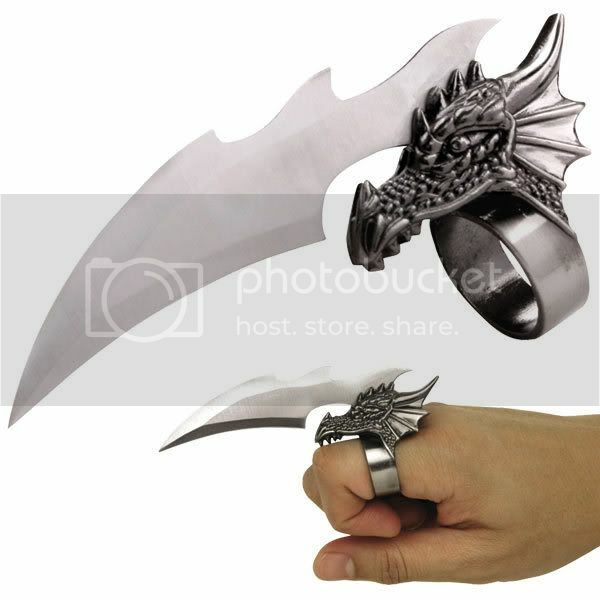 So, in summary: PHAIL WRIST MOUNTED FIGHTER BLADE IS AN EPIC PHAIL. But for most of us, we can overlook all of that glorious phail, because it does look cool. Be nice to hang up on your wall. Or for some impressive LARP action. Just don’t count on it for any real CQC. At least not without a major redesign. Actually it would be really easy to redesign, and would be a fairly formidable weapon if properly outfitted and secured. So maybe it’s not a total loss. But I do have one little question… What’s with the freakin’ tassels?!? 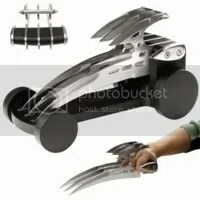 And No, in case you are wondering, I don’t think this was intended to be some kind of uber wolverine claw replica. At least it doesn’t seem that way. 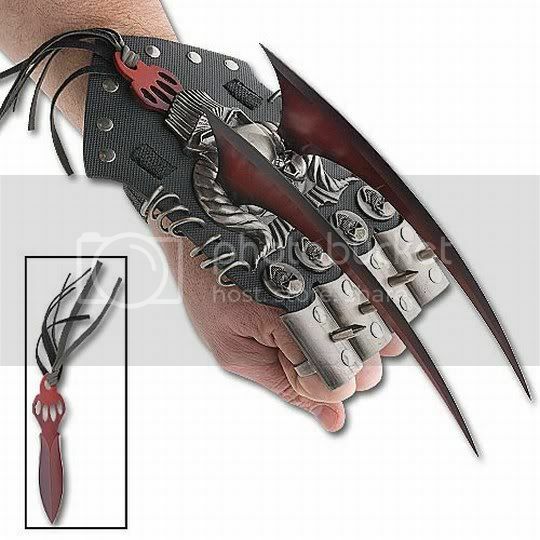 But then again… Either way, it is an interesting take on the whole hand held claw weapon thing. As with all the other Wolvie style dealios, we have three primary blades, but that is pretty much where the similarities stop. The blades on these are actually dual tiered, with the bottom blades conforming somewhat to the original Wolvie design, with a few modifications, such as slots cut into the blade, as well as a wider ovoid grip. The grip is an interesting departure from the norm, since it also includes two polished end pieces that allow for an extended grip that give each finger a grip area, as opposed to most of the others, where only the middle three fingers are used, or you have a knuckle-duster like design. In addition to providing additional side protection for your valuable little piglets, I’d imagine this would be a much more comfortable arrangement. 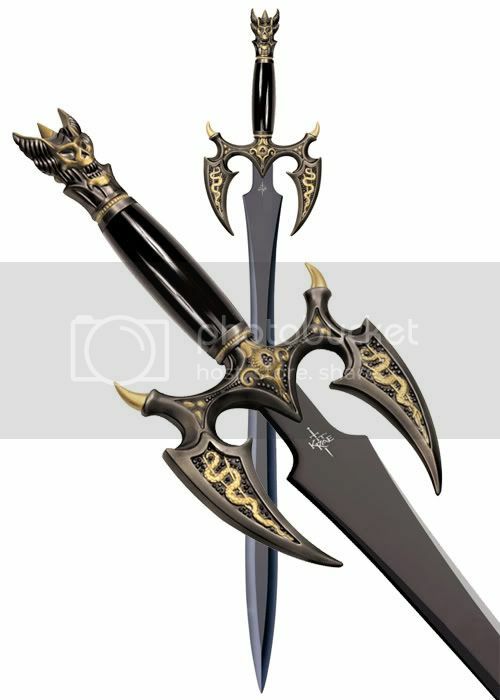 Speaking of which, the second tier of the weapon features a set of short smaller sub blades with an interesting twist. The rear of the top blades are connected by a bar that looks like it is intended to rest over the back of your hand when being wielded. Now this is an immense improvement over the other designs, which either featured no anti-rotational design aspects, or incorporated nubs that just as likely wear holes into the skin between your knuckles. Awww, who am I kidding. 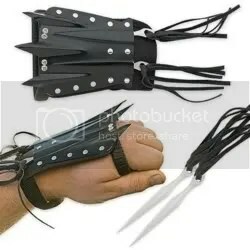 I would probably have complained that this looked nothing at all like Wolverine claws, if they had named it such. I guess there is no pleasing fanatics. But it still gets props for being the one wolvie-like claw weapon most likely to be used by yours truly, were I ever given a choice between the lot. If you recall, a several posts ago, I blogged about a dark sword, from Kit Rae canon, which seemed to have too much going on in it’s life for it’s own good. Well, today I ran into one of it’s cousins. Now the blade profiles on Kit Rae swords are generally quite the lookers, if a little narcissistic and this one is no exception. I find this one exceptionally notable in it’s simplicity. There is a beautiful combination of straight lines and subtle curves on this flat black blade. But as usual, the hilt is where all the action is. This time around, there is actually a discernable theme! An i’m calling it the Demon Talons. 🙂 The pommel is made in the image of a rather irate looking horned demon, which sits atop a simple high gloss black grip with a mild swell in the middle. The grip runs into the unique guard, what I will call the “talons” of the demon. The guard is basically a set of cool horned claws. Or clawed talons. Or taloned claws if you so desire. Your choice. 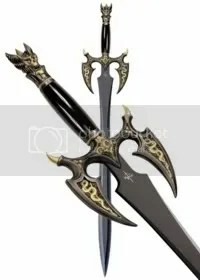 🙂 the point is, there are a set of what look like golden wing claws, atop the downward pointing black talons of the guard, at either side of the blade. I really like the overall combination if gold talons and black. OK. Big bad finger blade. We get it. But “Touch of Death”? Errrm… No. As I’ve mentioned in a previous post, there is a reason that finger weapons are far and few in the history of medieval weaponry. They aren’t particularly lethal. And they have a nasty habit of damaging a wielders fingers if used improperly. Unless, of course, they are poisoned. But even then they are, at best, an assassins tool, since no self respecting combatant worth their salt would let you get close enough to cut them (especially in any lethal fashion) with such a thing. Unless, again, they didn’t see you coming. Now I really like the aesthetics of this weapon. The little dragons head is well done, and the blade itself actually looks fairly sinister. And whose to say there weren’t vicious blade headed unicorn dragons back in the day? 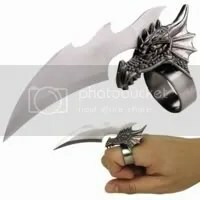 My only gripe with this weapon is that, sadly, the ring is too small for anyone to have any real control over the blade. You could prbably cut someone if you back handed them, with it, (and you might cut yourself in the process) but forget stabbing and such, unless you have really, really, strong fingers. 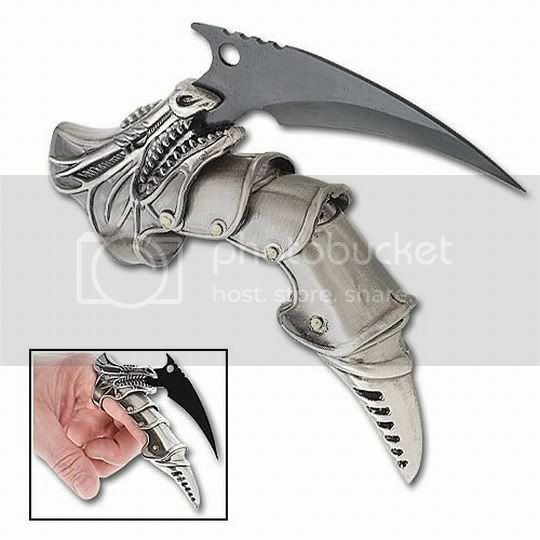 You’d probably hurt yourself worse than whatever it is you were trying to stab or claw at. But it looks pretty cool. ‘Nuff said.